The winged altar-piece, which dates from about 1350/60, was originally located in the Franciscan Church of St Clare in Cologne and was only transferred to the cathedral when this church was deconsecrated and demolished. At the centre of the altar-piece is a protruding shrine casket. The altar-piece has a pair of double wings, which means that three different transformations—each magnificent and each very different from the other—are possible. The paintings on the wings were painted over in the year 1400. Unfortunately, when the altar-piece was restored between 1907 and 1909, the value of these more recent, medieval paintings was not fully appreciated and so, the medieval paintings were removed from both sides of the outer wings, revealing the older paintings. When the altar-piece of the Poor Clares is closed on working days, six male and six female saints can be seen on the outside of the first pair of wings. Each of the saints stands in front of a red background decorated with gold patterns beneath a tracery arch in one of two arcades. Inscriptions allow each of the saints to be identified. 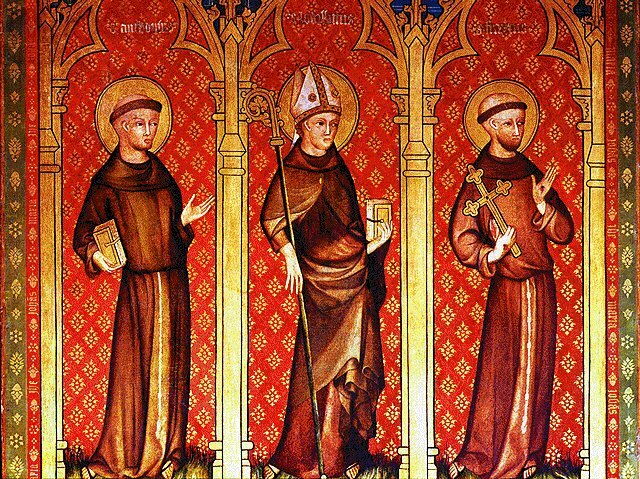 In addition to the patron saints of the church and virgin saints, most of the saints are Franciscan saints (e.g. St Francis and St Clare) or saints who lived the life of poverty so cherished and esteemed by the Franciscan orders (e.g. St Elizabeth of Thuringia). They all face the tabernacle shrine in the centre of the altar-piece, which was used to house the Host. This is the first example of a medieval altar-piece serving a Eucharistic function. The figure of St Clara shows this quite plainly: she is holding a monstrance containing the Blessed Sacrament. The centre shrine, which can now be seen even when the wings of the altar-piece are closed, was once covered on working days by a panel attached to the outer right-hand wing. The lower part of this panel, which still exists, shows the Crucifixion of Christ. The upper part, of which only a photographic record remains, shows the Man of Sorrows standing in a half-opened sarcophagus surrounded by the instruments of the Passion.